Michelle Williams totally threw us for a loop when she announced that she'd tied the knot with musician Phil Elverum in a private ceremony in the Adirondack Mountains in July of 2018, but the two are clearly smitten, no matter how short their courtship. As the actor told Vanity Fair back in September of last year, "Ultimately the way [Phil] loves me is the way I want to live my life on the whole. I work to be free inside of the moment . . . and I am finally loved by someone who makes me feel free." So what do we know about the 40-year-old songwriter and producer, besides the fact that he and Michelle look totally adorable together? He was part of a band before becoming a solo artist. In 1996, Phil founded The Microphones, and he served as principal songwriter, frontman, and producer for the band until he decided to strike out on his own in 2003. 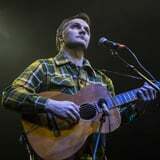 Since then, Phil has recorded and performed under the name Mount Eerie, a name taken from the area in Anacortes, WA, called Mount Erie. The Microphones also had an album of the same name, which was released right before Phil made the switch. As he explained in a 2003 interview with Discoder, "Mount Eerie is a new project. The Microphones was completed, or at least at a good stopping point. I did it because I am ready for new things. I am new." Since then, he has released an insane nine studio albums on his own. He changed the spelling of his last name. Around the same time Phil decided to start recording under his new persona, Mount Eerie, he decided to make a slight change to his real-life name, which was originally Elvrum, adding an extra 'e' so it had the same spelling as the Norwegian town of the same name. When asked about the change, he explained to The Believer that the change happened while he was living in Norway. "I just started writing it that way there," he said. "I think I had to fill out a government form . . . and I just wrote it that way to avoid the conversation of having to explain why it was spelled wrong. And then I just kept it that way because I thought it would be confusing." He was previously married. Just as Michelle tragically lost Heath Ledger, her former lover and the father of her daughter, Matilda, Phil also experienced the passing of someone very special to him. Phil has a daughter, Agathe, from his previous marriage to Canadian artist and musician Geneviève Castrée. Geneviève died in 2016 just one year after she was diagnosed with stage IV pancreatic cancer. Many of the songs on his album A Crow Looked at Me allude to his late wife and the ordeal of her illness, as well as the struggle of life without her. He moved across the country to be with Michelle. In her Vanity Fair interview, Michelle revealed that Phil left his house in Anacortes, WA, behind in July to be with her in Brooklyn, NY, where they now share a home with their two daughters.